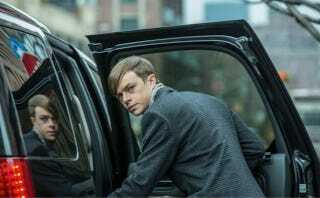 Amazing Spider-Man 2 director Mark Webb and actor Dane Dehaan each tweeted photos that give us our first official look at two characters from the sequel. Behold the weary-looking young Harry Osborn and Jamie Foxx as Max Dillon, better known as Electro. Some photos of Foxx in his Electro lights surfaced earlier this week, but Webb has given us a view of Foxx as Max Dillon, with a wall of Spidey going on in the background. These obsessions never end well.